As most of you know I am working on our upstairs bathroom (if you don't check it out here and here). Before I write about the last steps of the shower redo I had to accept a challenge. You see while I was reviewing my New Years Resolutions on Monday, I realized that I have not done any work on organizing our house. Zip. Nada. Then it hit me...accept the Pinterest Challenge! Katie from the Bower Power and Sherry from Young House Love started doing the pinterest challenge last year and its a great way for people to own up to their obsessive pinning and actually do one of the projects. This time they also included Cassie from Hi Sugarplum and Erin in from The Great Indoors. I decided to knock out three things in one: Work on the bathroom, Organize a part of the house and Participate in the challenge. And all with a small, shallow linen closet! Oh did I forget to mention that it is covered in grout dust! That goes to show you that just because there is a door, doesn't mean that they won't get grout on them. Well this is our messy and disorganized closet. I knew I wanted a prettier system and a little more color. I looked to pinterest for some inspiration and I found some great closets. This closet from BHG.com has great color, organization and style. This closet from beneathmyheart.net proved that a small space was no excuse! Finally I loved the baskets in this closet at diydesignfanatic.blogspot.com. I started this project by tackling the grout dust and the clutter. I removed everything from the closet and wiped it down. This doesn't even include towels! It was good to go through and find expired medicines and whatnot but we also found some random treasures like this very outdated digital camera that is about 8 years old. I also found a great pumice stone...granted it's shaped like a Christmas tree and has probably been in there longer than I care to admit but it's still in the packaging so don't judge me- I am going to use it now. Finally I was left with a bare closet. And a few coats later, using the paint from our downstairs bathroom, it was looking better already. Next came the shelving. Since I was on a budget, we kept the same white shelves but I hit Walmart for some cheap affordable baskets to help organize everything and make room for some towels for the hubby and I. A little organizing and a little rearranging later and Presto Chango, we have a more organized and prettier closet! I still have to make some pretty labels but I loved how it came out. We have my hubby's stuff in the top basket. Then the middle basket are our health and wellness items (such as vitamins, medicines and first aid) and then the last basket is just for me! I haven't had a chance to really use it since our bathroom is still under construction but I may have been sitting on the floor admiring it last night. It feels so good to get this organizing project done! I feel better already and I can't wait to use the bathroom in all its beauty. Have you completed any projects lately? Did you rise to the Pinterest Challenge? Thanks Latoya! And don't worry. I think everyone has a part of their house that needs this. BTW- I love your grocery pinterest challenge. Very inspirational! Great idea. We have a tiny closet in our hall bathroom and I just started organizing it a few days ago. Now I just need to go pick up some storage baskets! Wow, that looks sooo much better! I also have a closet like this in my bathroom which needs attention in a bad way. It's a very deep closet so there's a lot of wasted space, which is partially why I keep putting it off. Thanks for the inspiration! Thanks! If it's a deep closet, you might want to check out pull out drawer units like they use in kitchens. I am going to be using them for our downstairs closet. I'll post about it when I get around to it and let you know how it goes. Thanks Christine! I love it. What a breath of fresh air to have a pretty, well-organized closet, huh? Always a great feeling to do that. Great job, and thanks for linking up to the Winter Pinterest Challenge! Thanks Erin! You had a great project as well. So glad I got to find your blog. Thanks Ashley! Can't wait to see your linen closet makeover. Oh, nice job! 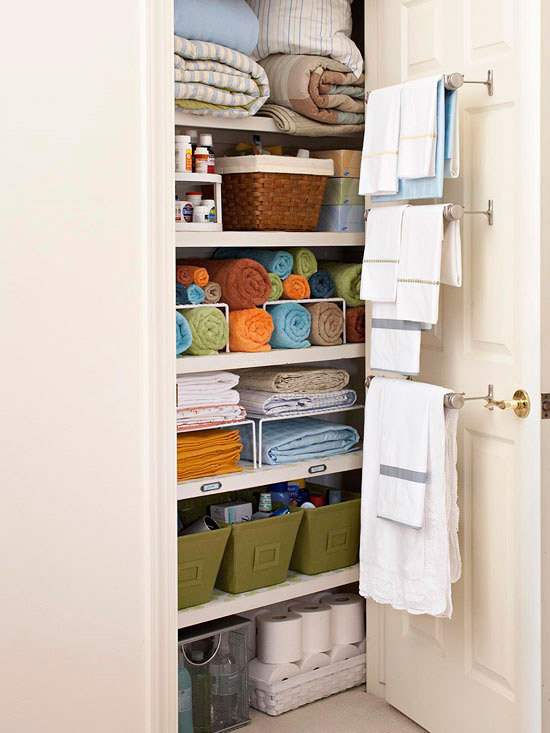 Love your linen closet! You know its makes me want to...Grout!